Free Intraday Tips for Today Updated on Tuesday, April 23, 2019 Time : 09:00 a.m.
We Provide Daily Free Intraday Tips and Free Intraday nifty level for Trading in nse stock market. We update this stock tips before market opens. You have to buy or sell the stock at the mentioned rates only. Don't Buy or Sell if the stock has already up from that level. Please booked Profits on Targets get achieved and very important exit from the stock if Stop loss triggers in our tips. If you are safe traders book 50% profits when target 1 is hit and change the stoploss to buying price if holding the balance for Target 2. 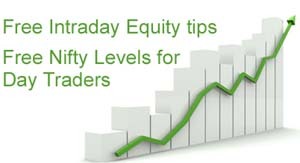 We Provide Daily One Equity Call & Accurate Nifty Levels Daily. We Update the Intraday Stock Tips Before Market Opens by 09.00 am. We Mentioned the Buying Levels, Target 1, Target 2 and Stop Loss for the trade. We Don't Provide any Follow up of this Free Intraday Tips via phone or Email, So Trade at your own Risk. We Don't Update this Free Equity Call in our Past Performance Reports, But we have accuracy of 85% to 90% in this free equity cash call. We Update our Free Tips Daily Before Market Opens. Please Buy / Sell as per your Risk taking ability in our Cash Equity Call. We don't Send this free call via Sms and also don't send any Follow up for this call. Please follow our Targets and Stop Loss strictly. We provide share tips in cash(equity), very high accuracy of more than 90% success ratio. Intraday Trading in Nifty is Advisable to Professional Traders only. We update Nifty levels for Free on every market day. Intraday Trading using this Nifty levels should be done at per your own risk capability. Stock market opens every day from Monday to Friday, Don't try to trade more and earn huge money is a single day or single trade. We Offer Two Days Free Trial for Stock tips in NSE Share Market. We will provide you 4-5 call a day with a good accuracy of 80-90%. We also give Pre Market Tips to our Trial as well as paid members before market opens. Note: We don't offer Free Trial to NRI customers as there is no option to delivery tips to international mobile via SMS. We have a Automated Live Calls Section in our Member Login, Which displays the New Intraday Tips or Alert in our Existing Calls by Buzz. This Service is available to Paid members only. We recommend this Service to our NRI Customers as well.